Tony Eisnnicher, owner of PJ’s Family Restaurant, receives a Community Service Award from Sunbury/Big Walnut Area Chamber of Commerce President Cindy Erndt as Executive Director John Fox looks on. The Chamber’s annual meeting includes a buffet-style dinner and a silent auction to benefit Big Walnut Friends Who Share. 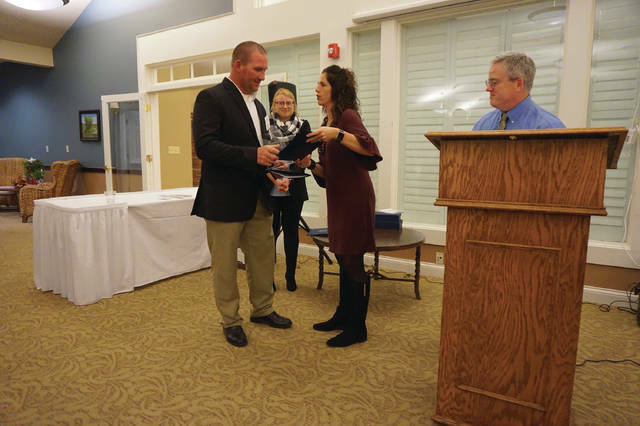 The growth of eastern Delaware County was noted at the Sunbury/Big Walnut Area Chamber of Commerce’s annual meeting, held Thursday (Nov. 8) at the Northstar Golf Club. 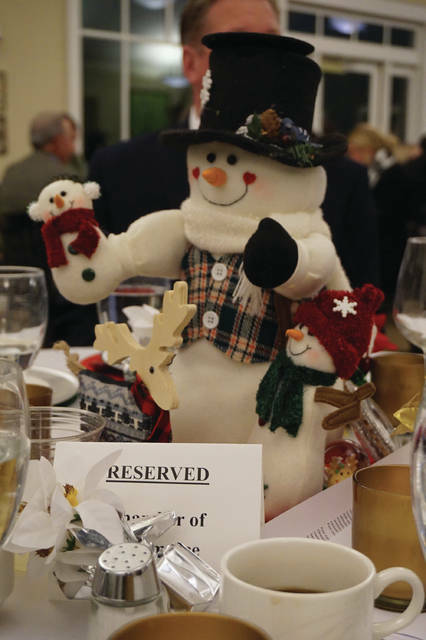 A couple hundred people attended to take part in the meeting, mingling, dining, bidding on silent auction items, and to seeing their fellow members receive recognition for contributions to the community. The recipients were: Tony Eisnnicher (Community Service Award); Middlefield Bank of Sunbury (Business of the Year); Chauncey Montgomery (Past President); Beth Panyik (Chamber Board Service); SnowPaw Solutions (New Business Member of the Year); and the Sunbury Lions Club (Special Recognition). Fox also mentioned a number of the events the Chamber is involved in, including the annual Business Expo at Big Walnut High School in April; the Farmer’s Market on the Square from Mid-May to Mid-October; Independence Day; membership breakfasts with community leaders; new member ribbon cuttings; and last, but not least, Christmas on the Square, being held on Dec. 1. Erndt encouraged people to sign up for Christmas on the Square’s parade featuring special guests from the North Pole, as well as the donut-eating contest that follows. According to its website, the organization is devoted to “Proudly serving the Villages of Galena and Sunbury, Berkshire, Genoa, Harlem, Kingston, Porter & Trenton Townships. The Chamber office is located at 39 E. Granville Street on the historic Sunbury Square. Our office hours are Monday-Friday, 9 a.m. until 3 p.m.
https://www.sunburynews.com/wp-content/uploads/sites/48/2018/11/web1_DSC03571.jpgTony Eisnnicher, owner of PJ’s Family Restaurant, receives a Community Service Award from Sunbury/Big Walnut Area Chamber of Commerce President Cindy Erndt as Executive Director John Fox looks on. 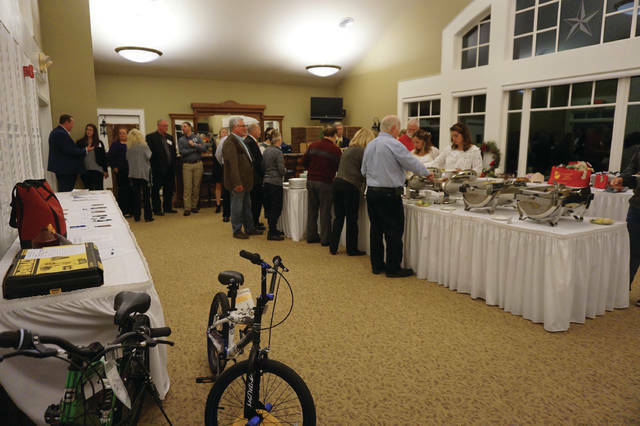 https://www.sunburynews.com/wp-content/uploads/sites/48/2018/11/web1_DSC03557.jpgThe Chamber’s annual meeting includes a buffet-style dinner and a silent auction to benefit Big Walnut Friends Who Share.